Manchester United Asia Tour 2009. Only five words on a web page and it was enough to make me hyperventilate with excitement. 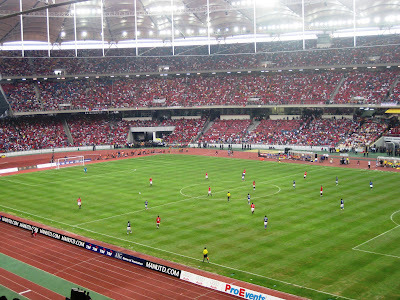 As part of their Asian Tour, Manchester United will be making a stop in Kuala Lumpur for an exhibition game against a selection team from Malaysia on July 18, 2009. As I consider football as my one great love, I had to go. It was my dream to watch a live match of a professional football club from Europe, where the formalities of the sport originated. 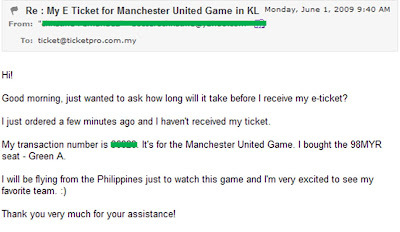 The pre-selling of the match tickets started May 22 in Malaysia. I was already feeling edgy that it might ran out and I didn't know anyone I could ask to get me one. I had to wait for the online public selling on June 1. 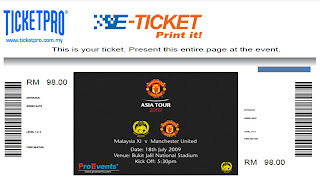 I purchased my ticket through Ticketpro Malaysia. There must have been a surge of online transactions as my e-ticket didn't arrive immediately after I finalized my purchase. I quickly sent an email to follow-up. I knew my transaction went through but until I get a hold of my ticket, I couldn't relax. ﻿﻿﻿﻿﻿﻿﻿﻿﻿﻿﻿﻿﻿﻿﻿﻿﻿﻿Around 7:00 P.M. the same day, I finally received notification that my ticket was ready for downloading at the website. I printed multiple copies. Now the half chunk of my task was accomplished. The other half of my dilemma was arranging my trip. 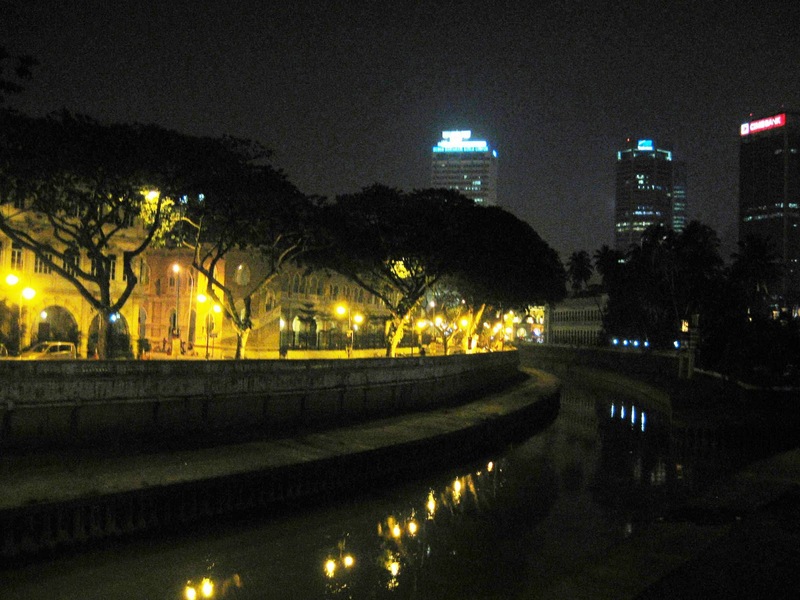 I felt anxious as it was my first overseas trip - alone. It wasn't a breeze preparing everything on top of my work. I didn't know much about Kuala Lumpur except that it's the capital of Malaysia and it's where you find the Petronas Towers. I didn't even know where to stay or how to get around. All details were sketchy. I had to research everything! 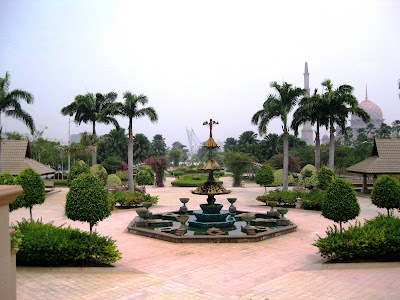 Though I was low on financial resources, I managed to arrange a trip to both Kuala Lumpur and Singapore. SG was an excellent stop for me because that's where I had friends I can stay with and treat me to meals. Haha! All I had to do was get there. Fortunately, airline tickets from KL to Singapore cost much cheaper than coming all the way from Manila. Thanks to my fave budget airline - Air Asia. 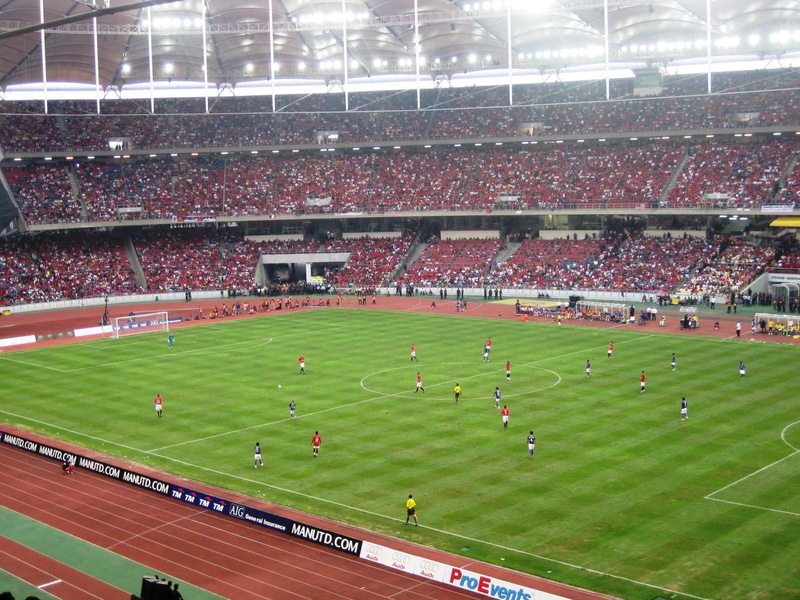 I arrived in KL a day before the game. At the immigration counter, I excited told the guy I was there to watch Manchester United and he gave me a big smile and chatted a bit. 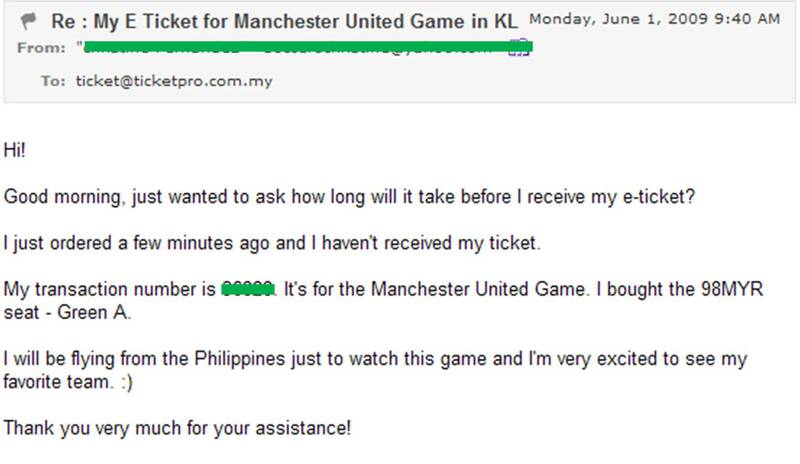 In a football country such as Malaysia, events like these don't go unnoticed. He immediately stamped my passport. Easy breezy. I rode a bus to the city center and walk all the way to where I'll be staying - Matahari Lodge . It was tucked in a small corner. I almost walked passed it if I hadn't seen it by accident. I decided to skip a meal that night and settled on munching the cereals I bought in Manila. The following morning, I carefully reviewed the instructions on how to get to the stadium. I planned to get there by lunch time, so I can grab a nice spot where I can get a full view of the match but a place in one of the brochures I read caught my eye. It was called Putrajaya which is known as Malaysia's intelligent garden city. I didn't care what's in it actually. Its name was enough to spark my curiousity and I just had to take a peak. 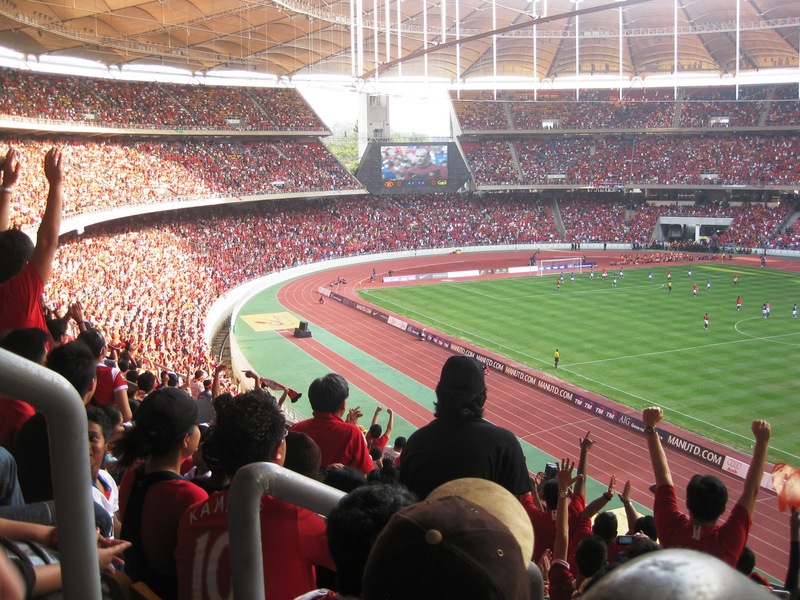 Since navigating myself to Putrajaya seemed easy, I decided to take a quick look before the game because it was my only free time in my tight itinerary. The match was scheduled at 5:30 P.M.. I had a few hours to spare. I boarded a bus from the terminal across my hostel and reached my destination in less than an hour. It was a lot more beautiful than what I imagined and I ended up spending a lot more time than I intended. I had to hurry to get to the game on time. 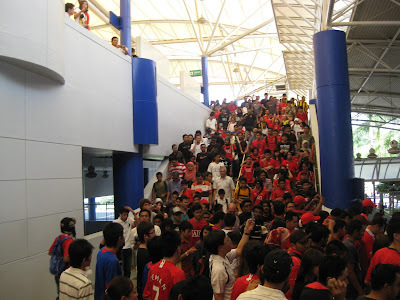 ﻿When I got to the train station bound for Bukit Jalil stadium at 3:30PM, it was already PACKED with a lot of people wearing Man U jerseys. Inside the train, everyone was in a great mood despite the heat and all that body bumping because practically everyone inside the train were all going to the same place. A few seconds before we reached Bukit Jalil, a young kid began chanting the Manchester United hymn that got everyone in a happier state. 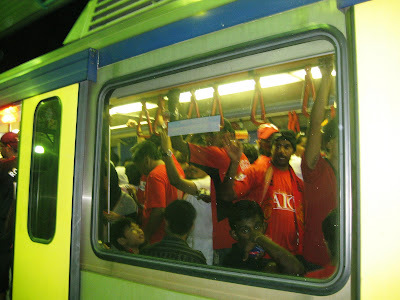 I was squeezed between several guys near the door throughout the whole ride but it wasn't scary at all because I felt at home at the presence of my fellow football fanatics. When we got out to our stop people stared cheering. Excited energy was in the air. Happy I got out of that in one piece! Look at that mob! It was such a happy day. I struggled to find my way to the gate I was supposed to go in. The crowd was so overwhelming! Finally, I managed to get through the gazillion of people that were so excited to get inside. I saw that there was a lot of time left before kick-off when I finally got settled in my seat. It was so humid! Sitting beside me was a friendly grandpa from Singapore who was with his grandson. The look of happiness in his face was priceless! But then again, almost everyone in the stadium carried the same aura. The much anticipated opening cermonies began and the rest was like a dream. All throughout the game, I couldn't believe I was there. The chanting, the wave, everything felt surreal! I felt so happy to be in the midst of thousands who love the same thing as I do. Though it was just an exhibition game, Man U put out a great effort which everyone appreciated and when they let Michael Owen play towards the end of the second half, the crowd went wild! 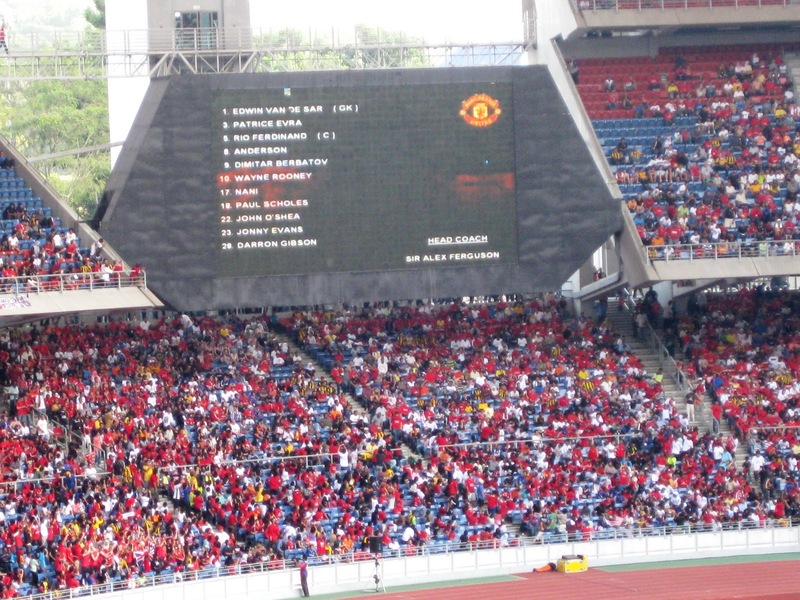 :) The game ended with Man U winning the game 3-2 versus the selection team from Malaysia. I had a great time despite being alone, though on several instances I wished there was someone I could share my reaction using my native tongue! Hehe!